Materials: Jars containing various strong smelling kitchen substances like cinnamon, coffee, pepper, mint, etc. Activity: Have your child close his/her eyes. 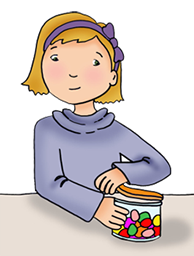 Present an opened jar to your child to smell. Have him/her guess what it is and/or what it smells like. After a guess is made, show them what is in the jar and talk about it. Suggested Script: I'm going to give you some things to smell. I'd like for you to tell me what it is or what you think it might be. Close your eyes and take a sniff. Other Activities: Use the same technique with other substances in different rooms. In the bathroom you can smell soap, shampoo, shaving lotion/cream. In the bedroom you can smell deodorant, perfume, etc.